Version “Get Your Mod On!” Released! Mods can now be submitted to Steam Workshop through WrackEd! They can be subscribed to and played through Wrack as well. Workshop submissions (both maps and mods) can now be updated after publishing through WrackEd! 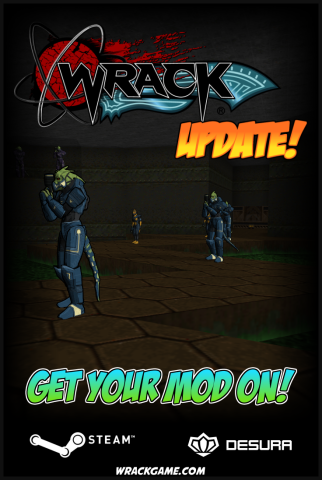 Wrack now automatically downloads updated versions of subscribed Workshop items. Added new gib sound effects! Gibs now make sounds as they bounce off of things. Added two new trooper death animations. Updated the display name of numerous objects in the editor. Added the “object shoots” face action activation type, which allows face actions to activated by shooting it. Added the GetVelocity() AI script command, which returns the object’s current velocity. Added new AI script commands for debugging mod development: AddOutputInt(), AddOutputBool(), AddOutputString(), and PrintOutput(). Added some cutscenes to the right side of E1L6 to better clarify what the switches do. Fixed a bug that prevented the railgunners from gibbing properly. Fixed a bug that prevented leaderboard replays from being watched on leaderboards with multiple entries. Fixed a bug that prevented the “enter” key binding from saving properly. Separated the subscribed map/mod menus in Wrack. Fixed a bug that prevented replacement textures in object spawned by spawners to not properly precache. Fixed a bug that allowed you to quicksave during intermission. Fixed a bug that prevented secrets from being re-findable after restarting a map in Time Attack/Score Attack. Knockback from rockets is now affected by the Doomsphere. Damage done to yourself from rockets is now affected by the Doomsphere. Fixed a bug that caused colorized sections of text spanning multiple lines to mistakenly be reset on subsequent lines. 3 Responses to Version “Get Your Mod On!” Released! Thanks for sharing your thoughts about test.